Paris is one of the most magical cities over the holidays. From gorgeous light and window displays to an extra joie de vivre circulating through the streets, the Parisians’ love of the festive season abounds. There’s actually much more to do beyond admiring the most famous holiday lights and window displays. From unusual light shows to pop-up markets, here are some unique events and happenings in Paris over Christmas and New Year’s, sure to add a special touch to your holidays in the City of Light. You can avoid the crowds along the Champs-Élysées and Les Grands Magasins by heading to some of the other fabulous, more original places to take in holiday lights. For example, Bercy Village, the former wine cellars of Paris now home to shops and café, gets decked out every year by a different top designer. This year, chic set designer Laurent Sanguinetti has transformed the attractive lane into a stunning enchanting forest, which will also host a range of special activities on weekends. In the center of the city, the historic shopping galleries around Opéra are always beautifully lit over the holidays, especially the Passage Jouffroy, where you’ll find some unique shops and the charming tea salon Le Valentin, perfect for break over a chocolat chaud. For something completely different yet wonderfully fun, visit the Espèces en voie d’illumination exhibition (included in our roundup of December events) taking place at the Jardin des Plantes. Normally closed at night, until January 15th 2018 the park is inhabited by large, illuminated lanterns of animals. It’s also the last days for the fantastic Gustav Klimt video-light exhibition at the Atéliers des Lumières, extended until January 6th. The items available at many of Paris’s Christmas markets can get repetitive, but there are a number of more offbeat options taking place in the lead up to the holidays. For the third consecutive year, La Fine Equipe is hosting its La Fabrique du Père Noël, a large pop-up store in the Marais featuring up-and-coming designers, on through December 23rd. Over in 11th you can stop by the Bastille Design Center from December 19th to 23rd for its Les créateurs ont du coeur, with all profits going to support people combatting HIV. 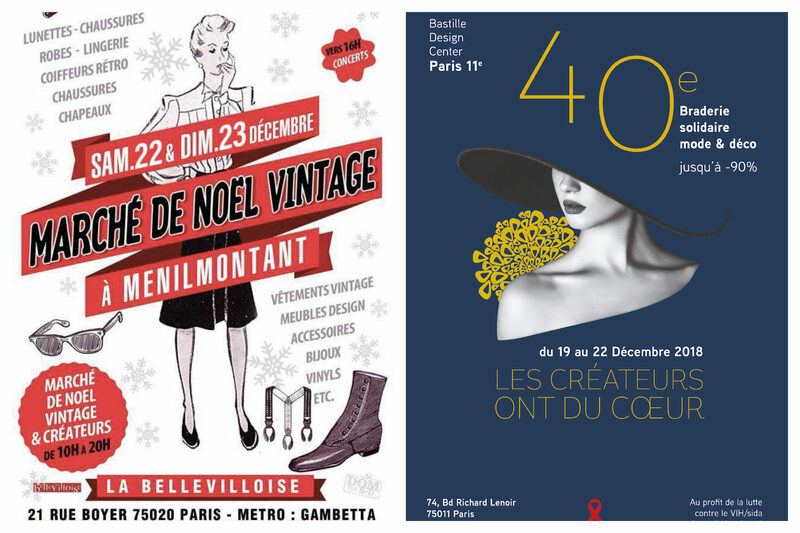 Up in northeastern Paris, the cool concert venue and café La Bellevilloise will be holding its annual Rétro Vintage Market December 22nd and 23rd, two lively days of vintage clothing, food stands, hairdressing, and concerts. France’s love of fine gastronomy is at its peak over the end-of-year festivities. Sampling French holiday specialties is definitely a way to partake in the season and you’ll find an amazing assortment of gourmet treats from bûche de Noël cakes to foie gras in pastry shops and delicatessens across the city. If you would like to learn more about these, join Context Travel’s Culinary traditions Holiday Walk. The holiday walk is held only in December and visits a holiday market and speciality food shops in the company of a food writer, chef, or culinary specialist. This is also a great tour to help you stock up on provisions, if you’re staying in town over the holidays. There is an abundance of concerts around the holiday season, many of which are held in the city’s loveliest churches. It’s also a good way to take in culture while remaining protected from the elements. There are concerts scheduled throughout December and early January at Notre Dame and the Église de la Madeleine. Or why not opt for something quite original, like the Candlelight Chopin concerts held at the lesser known Église Saint-Éphrem. You also can peruse the listings of paid concerts on Classictic and find some information on free ones here. Perhaps you have some extra time over the holidays and would like to get involved in the community on a different level? There is a variety of volunteer opportunities in Paris and several are either easy to participate in or particularly fitting for the holidays. Les Restos du Cœur has been providing meals to those in need since being founded by French actor Coluche in 1985. This year, they’re in need of volunteers to help with their gift-packing operations. If you’re concerned about the global immigration crisis, you can help out directly in Paris through Utopia56. The English-friendly group offers assistance to refugees, especially around the Porte de la Chapelle, by distributing food, medical care, and clothing — they will certainly be looking for clothing donations this winter if you would like to contact them for a simple donation. Lastly, with a little French, you can sign up to the site Benenova, which lists a range of volunteer opportunities including on-off commitments. Are you more into luxury? Read about how to have an indulgent Christmas in Paris. Searching for the perfect gift? Check out our guide for finding a unique gift in the city of light. Written by Lily Heise for HiP Paris. Looking for a fabulous vacation rental in Paris, London, Provence, Tuscany, Umbria or Liguria? Check out Haven In. Mention the code: HiPParis18 for special deals and a bottle of champagne with every booking for all HiP Paris readers!